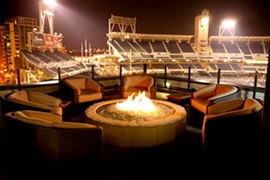 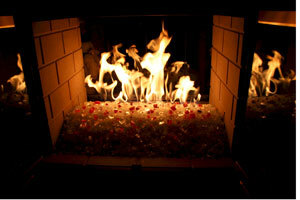 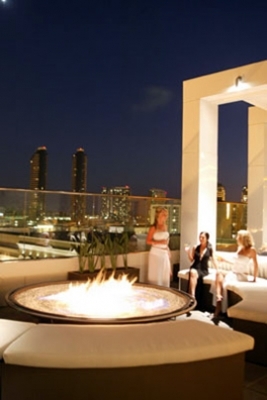 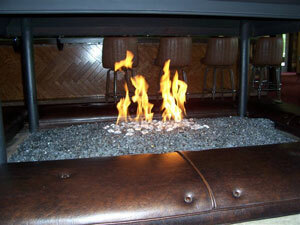 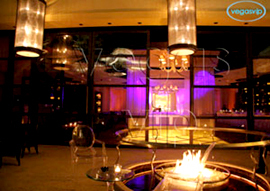 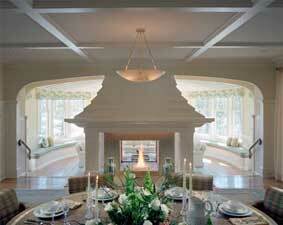 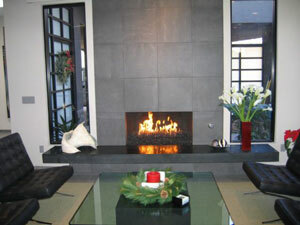 The fireplace below is located in Beverly Hills California. 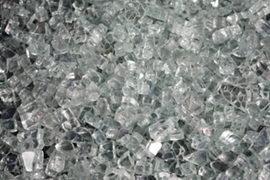 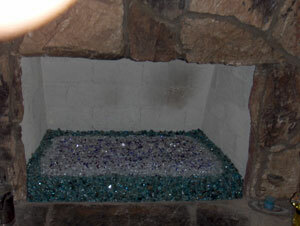 We used a Gray fireglass with about 6 lbs of Clear Diamonds. 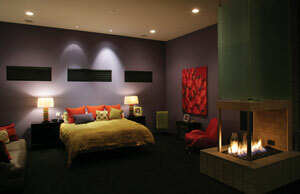 Remember each surround is custom. 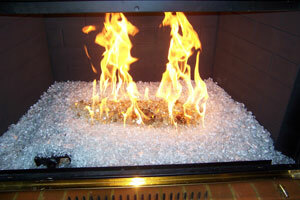 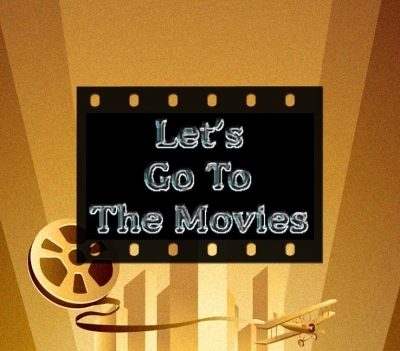 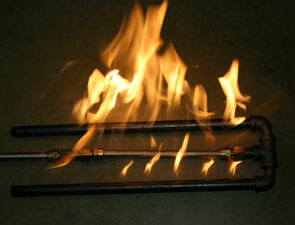 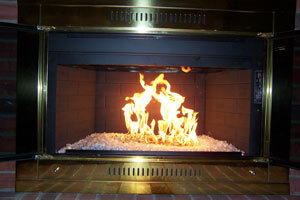 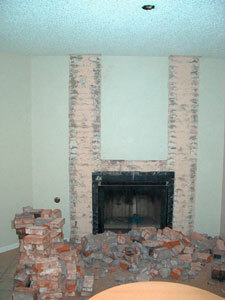 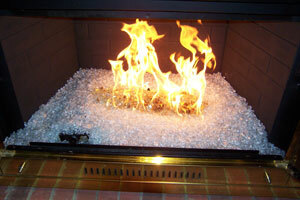 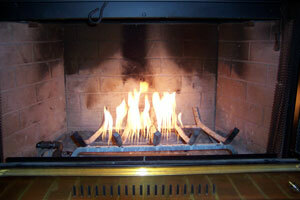 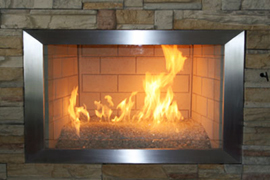 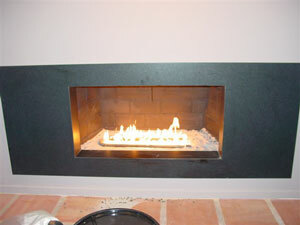 And we will need to see photos of your fireplace and send to your exact specfications. 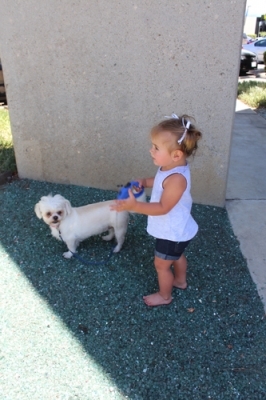 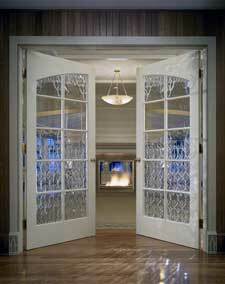 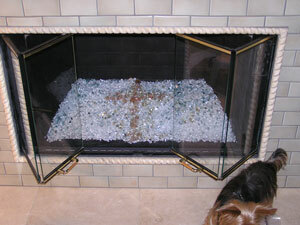 One issue that came up, was Martha noticed the glass had discolored in a few places. 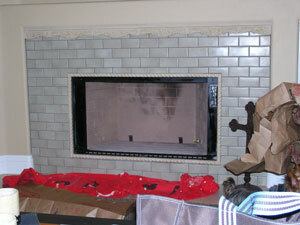 So when we got the pictures we enlarged the pictures only to find splash marks on the back wall. 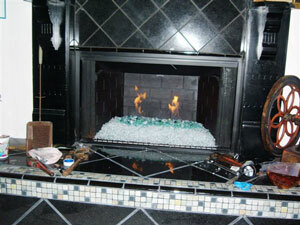 Which as it turned out, was her grand-children who were throwing some flammable liquids into the fireplace. 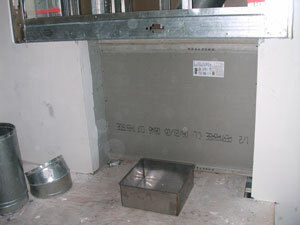 Below you can see the splash marks. 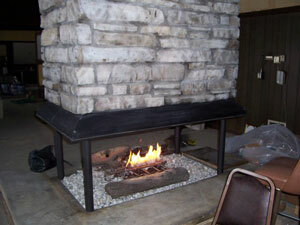 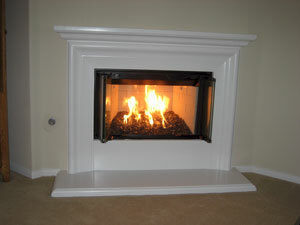 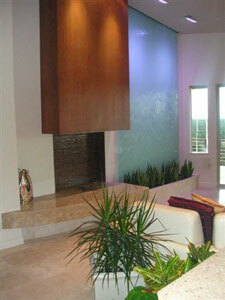 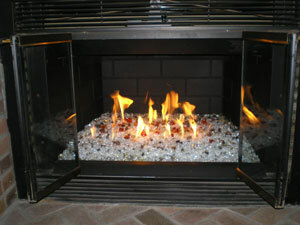 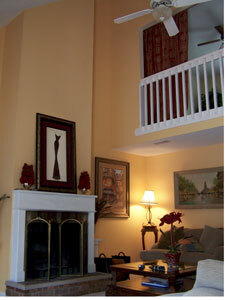 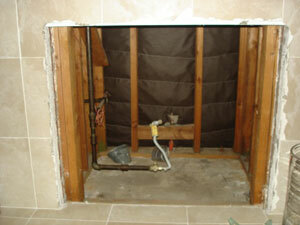 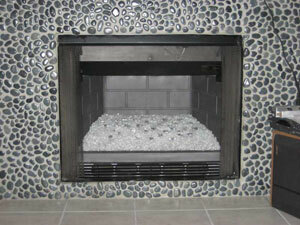 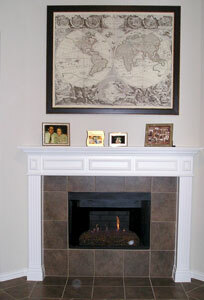 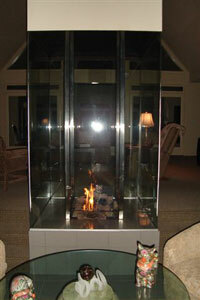 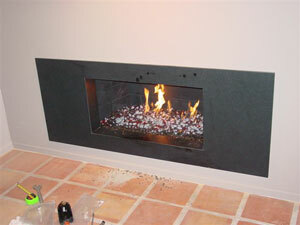 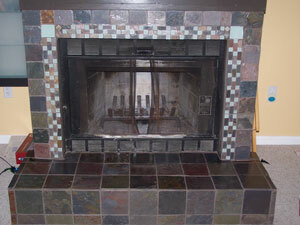 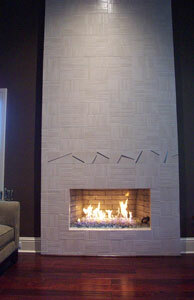 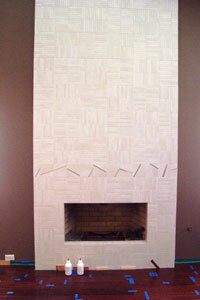 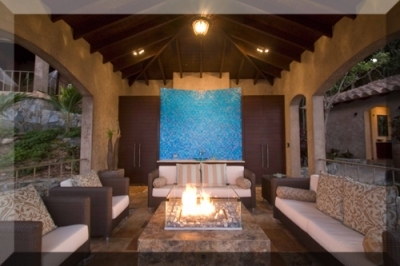 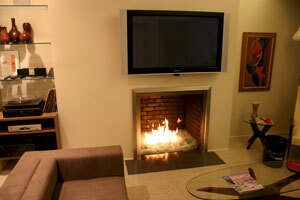 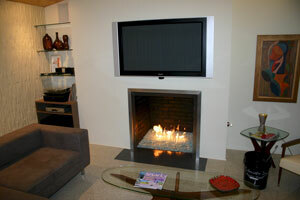 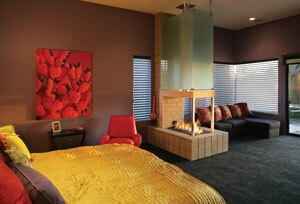 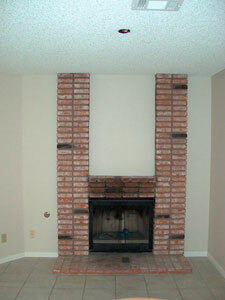 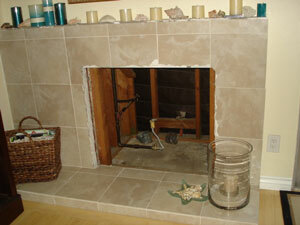 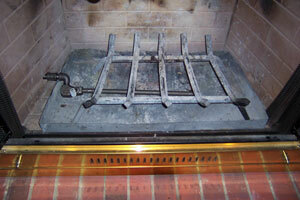 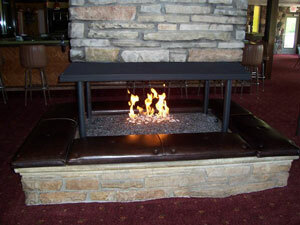 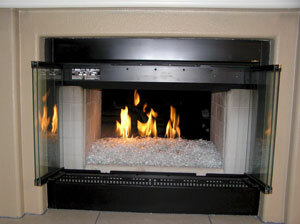 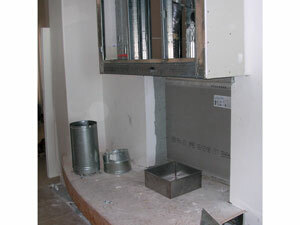 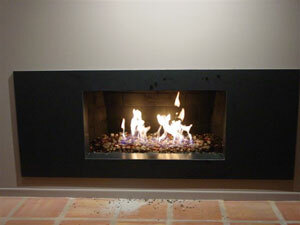 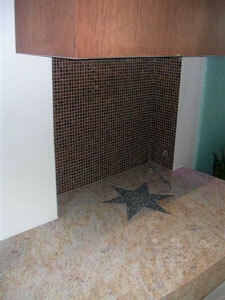 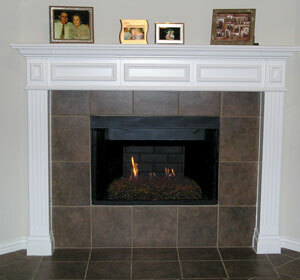 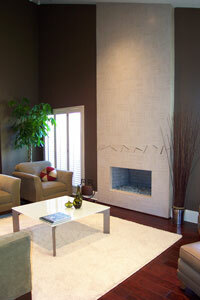 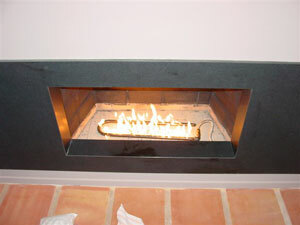 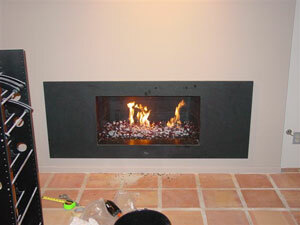 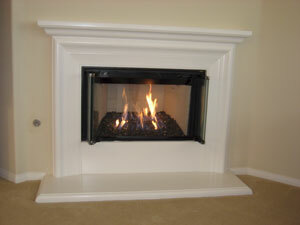 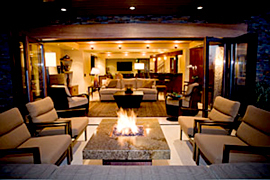 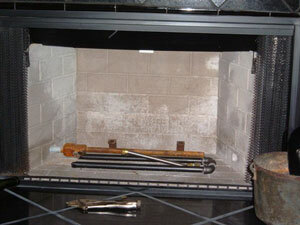 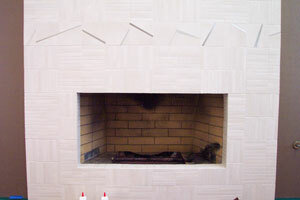 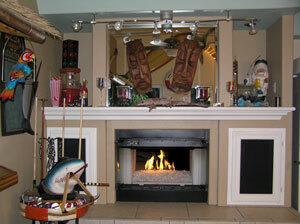 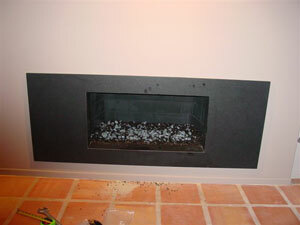 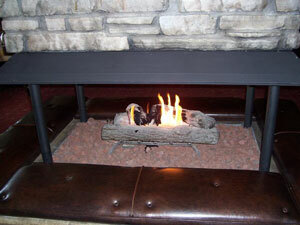 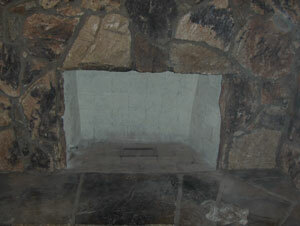 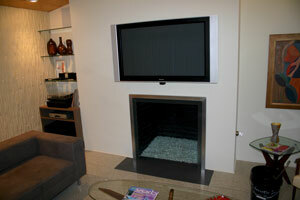 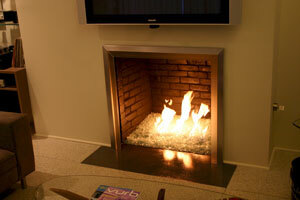 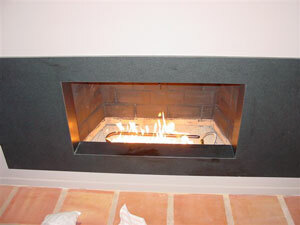 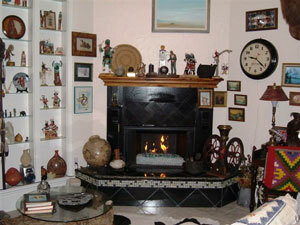 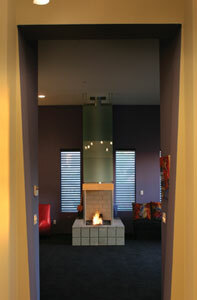 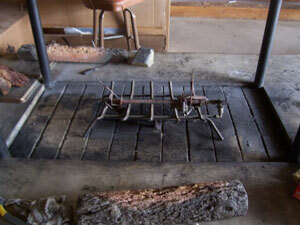 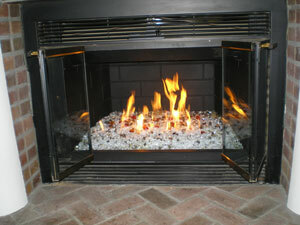 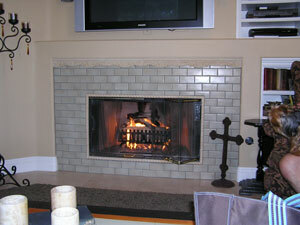 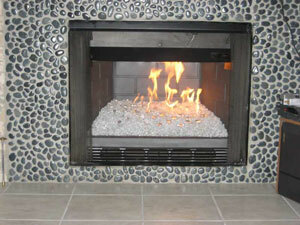 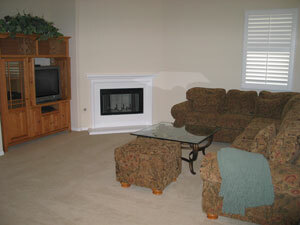 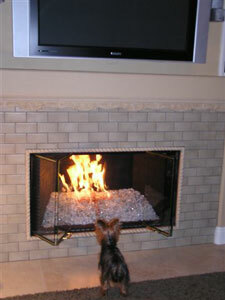 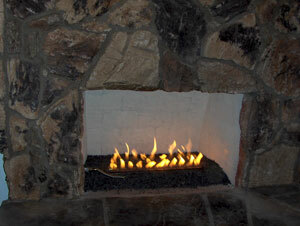 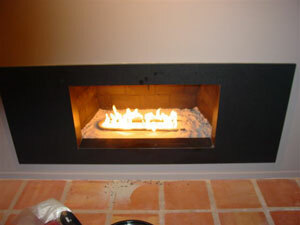 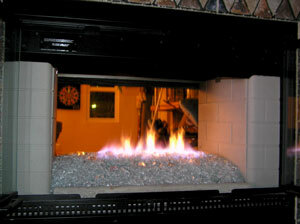 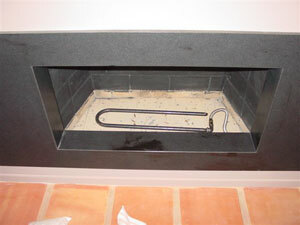 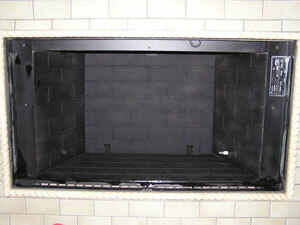 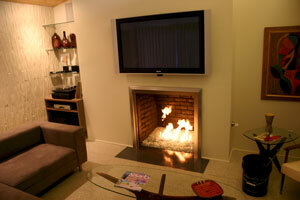 The fireplace below was installed by our customer John in Palm Springs. 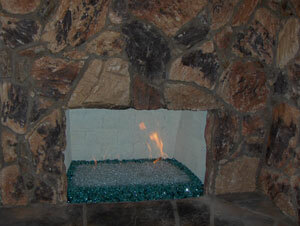 He used a sand base with Azurlite fireglass on top. 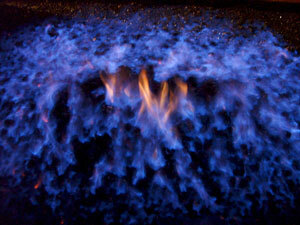 Toppers: Pink, Cobalt Blue, Fuchsia, Hyacinth, Amethyst, Pale Cobalt Blue, Aquamarine, Lilac, Steel Blue and Purple. 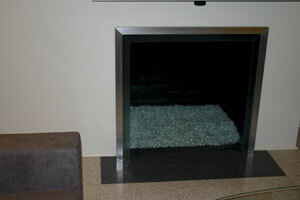 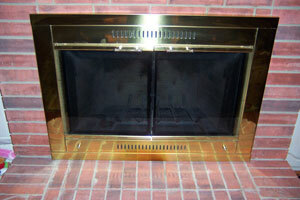 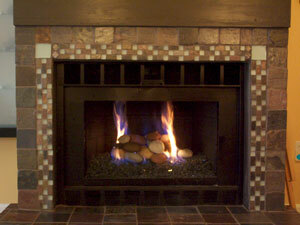 A Fireplace Using Bronze and Amber Fireglass. 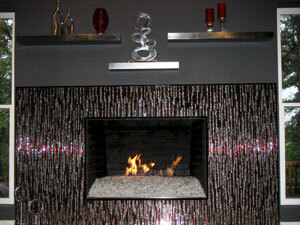 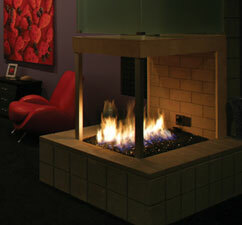 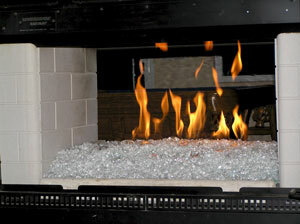 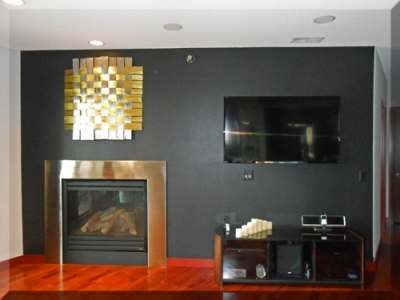 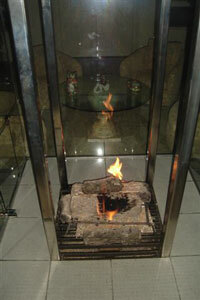 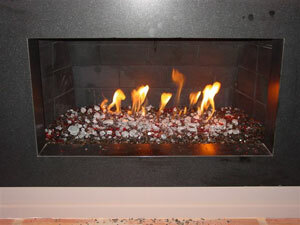 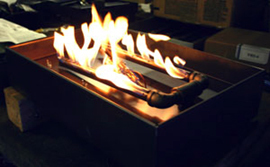 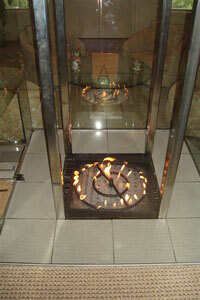 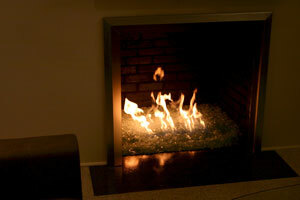 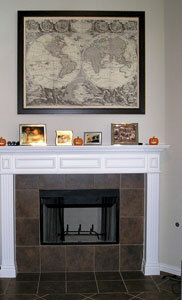 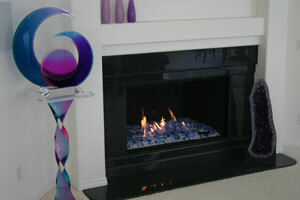 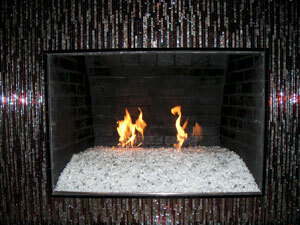 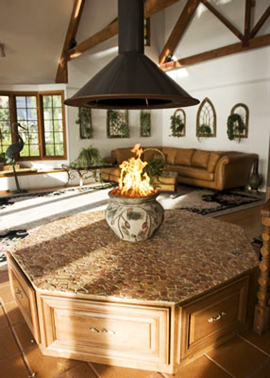 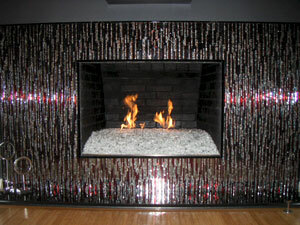 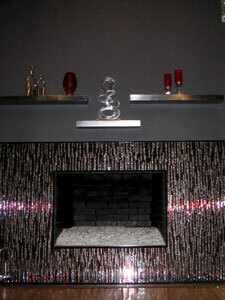 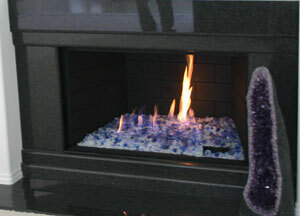 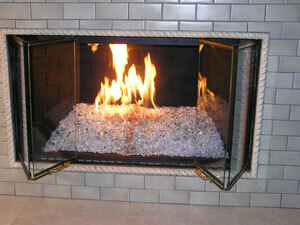 The fireglass featured in this fireplace includes, Bronze Reflective, Black and Black Reflective and Amber. 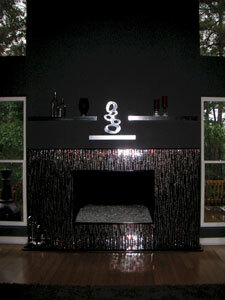 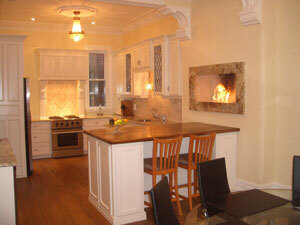 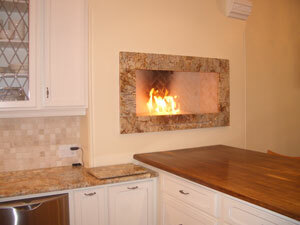 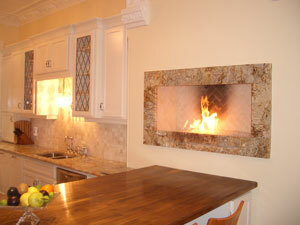 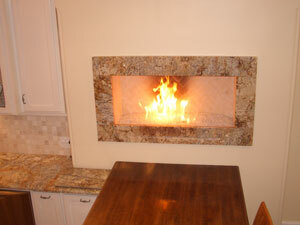 This lovely kitchen fireplace, utilized some Starfire fireglass. 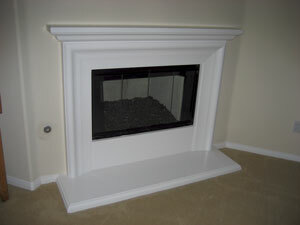 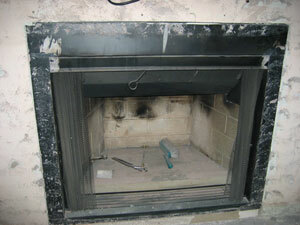 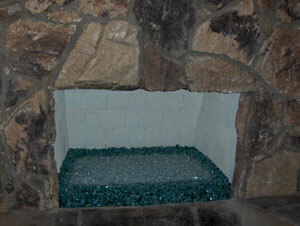 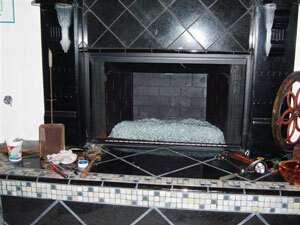 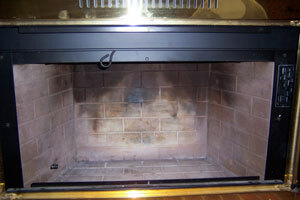 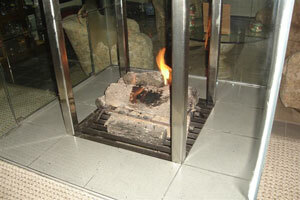 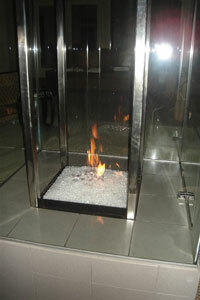 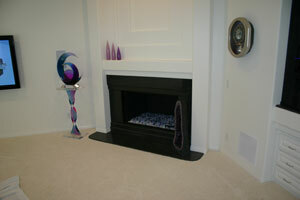 Here are a few more pictures sent to us by our customer.The completed fireplace used Clear base fireglass. 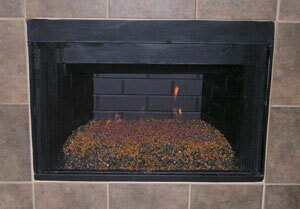 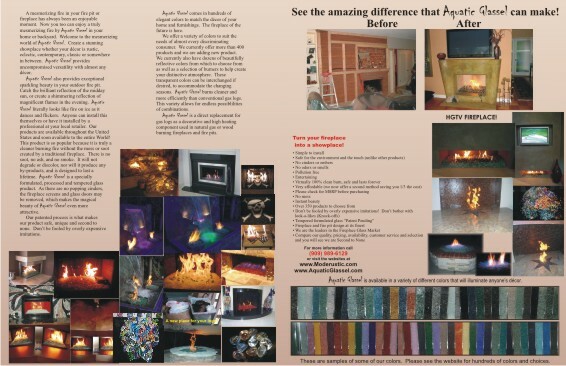 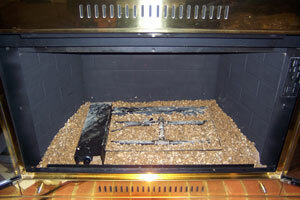 Another fake log fireplace transformation. 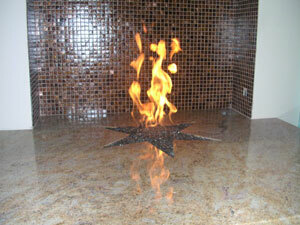 With again using our very popular Starfire Fireglass and Rhubarb Topper. 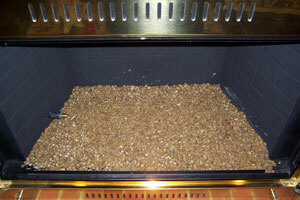 Towards the end they also added some Gold and Green Pyrite. 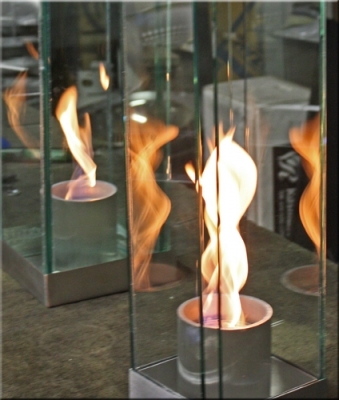 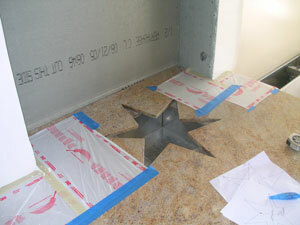 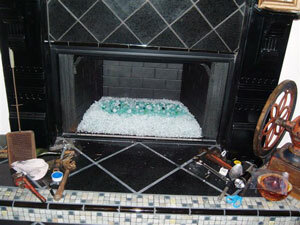 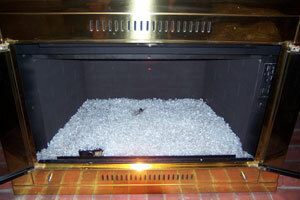 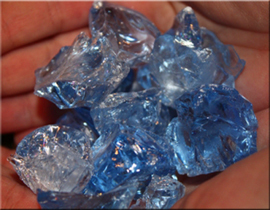 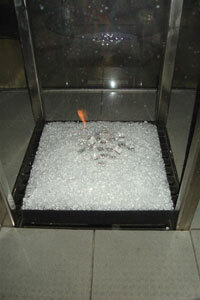 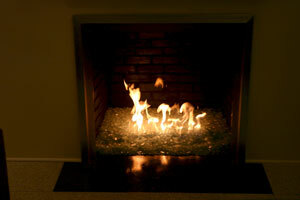 Sample #6 Of A Fireplace Using Starfire Fireglass and ICE Topper. 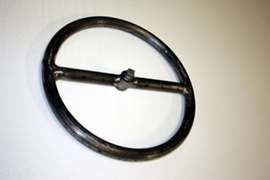 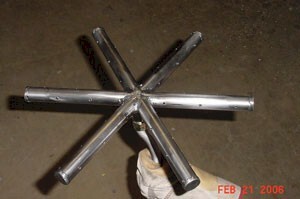 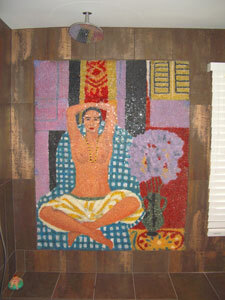 This Art-project was produced by Dan Tipton of Palm Springs CA. 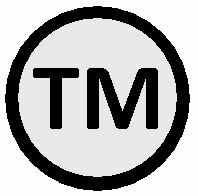 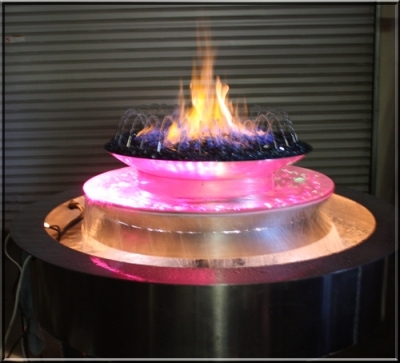 The project below has Pink Rosa, Azurlite, Starfire, Black, Neo Lavender, Pink Rosa and Evergreen Reflective. 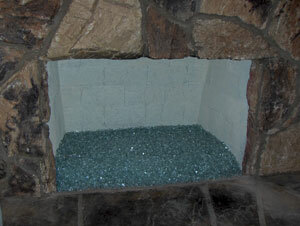 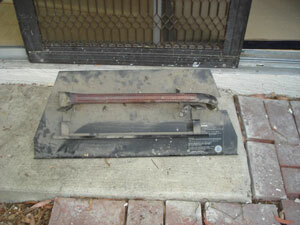 This is now a window in Palm Springs and produced by Dan Tipton, eatdrttipton@earthlink.net tell him what you think. 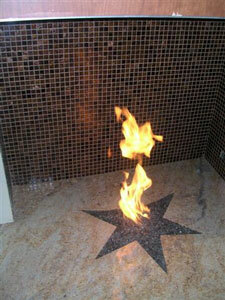 The house below is in Cape Cod and has Starfire. 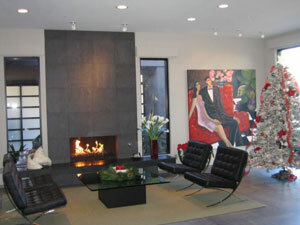 Click Here to see the house in full detail and who built/ designed it! 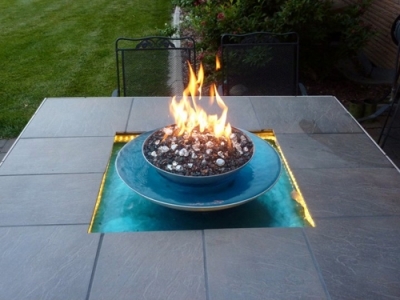 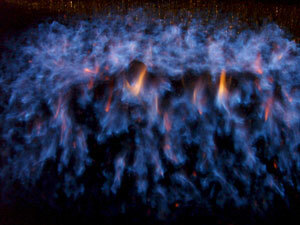 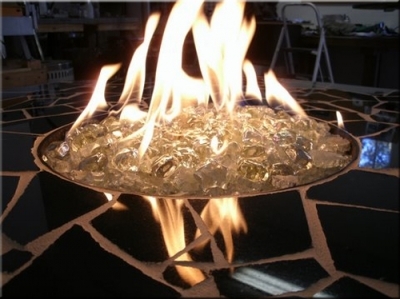 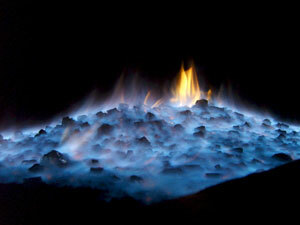 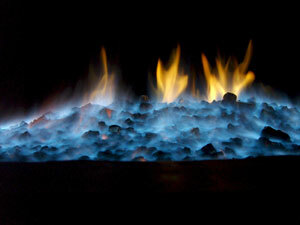 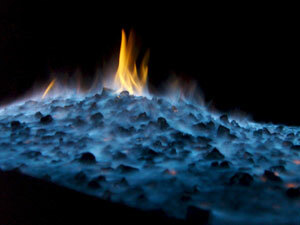 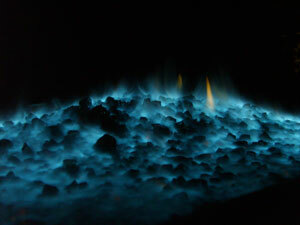 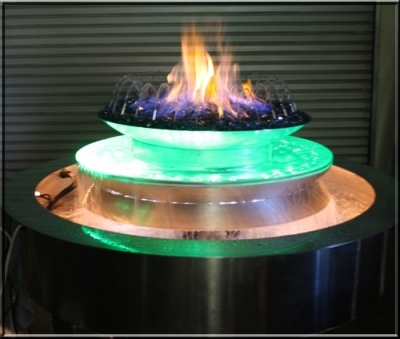 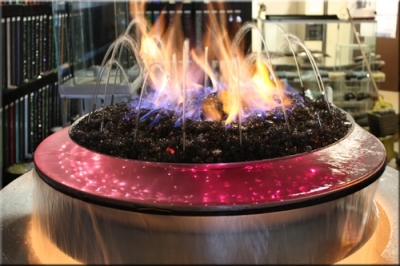 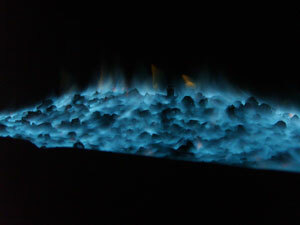 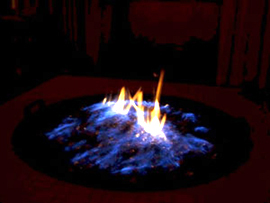 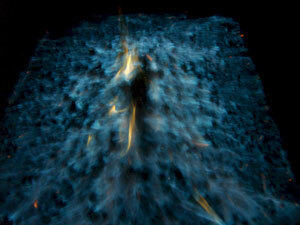 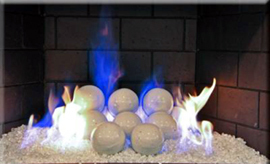 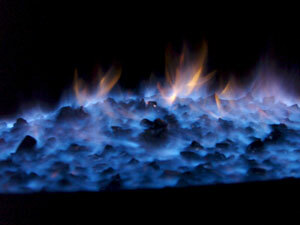 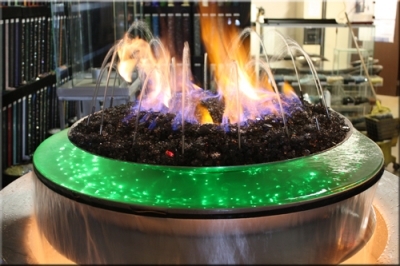 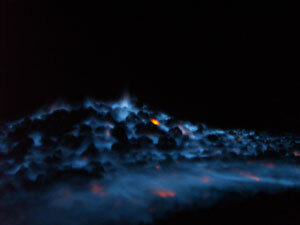 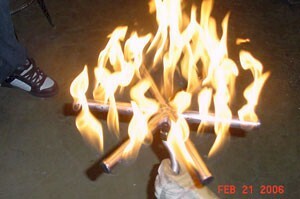 A Fire Pit Using Our Black Magic, Which Turns Flames Blue/Green. 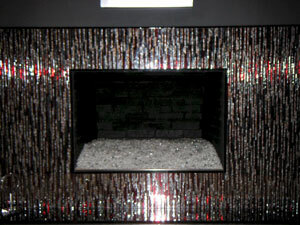 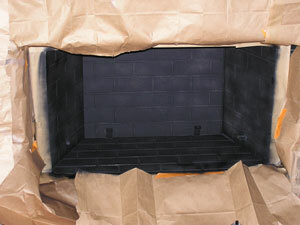 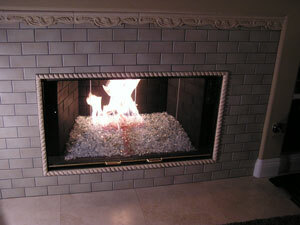 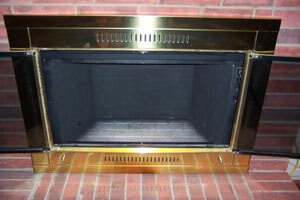 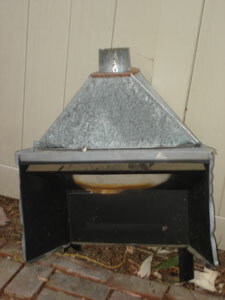 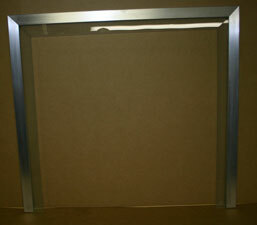 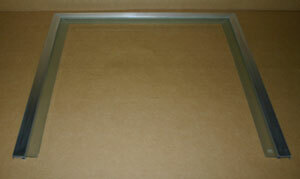 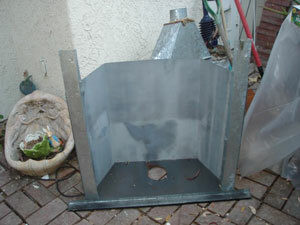 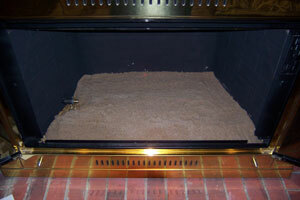 This fireplace is using 1/2" Gray, Bronze, Bronze Reflective, 1/2" Bronze fireglass. 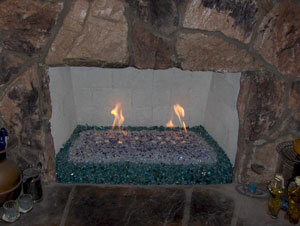 Starfire and Ice on the left. 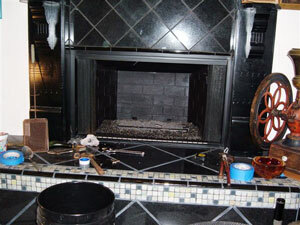 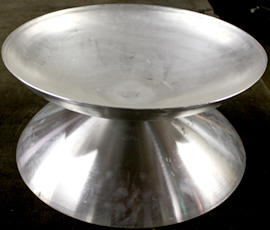 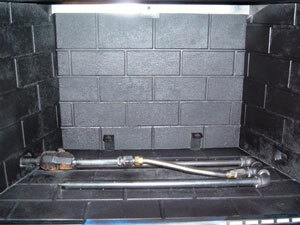 Pan and ring burner on the right. 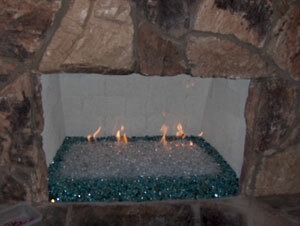 The fireplace below has Starfire, Ice and Copper Ruby. 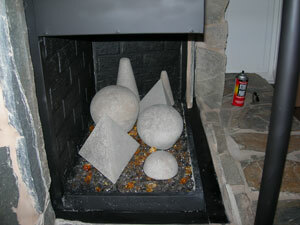 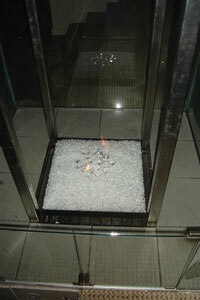 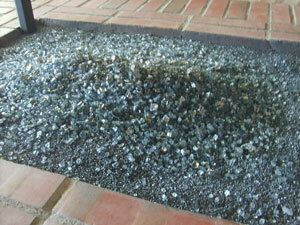 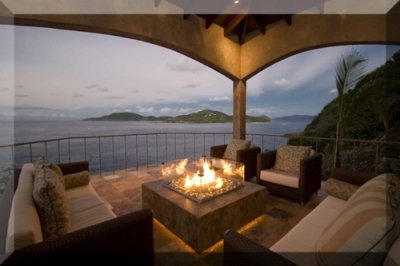 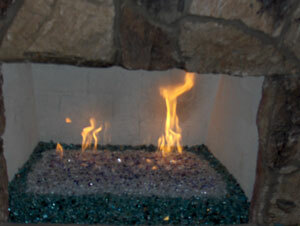 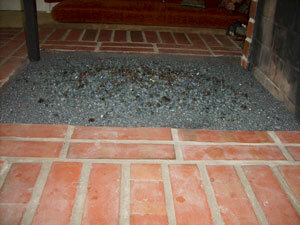 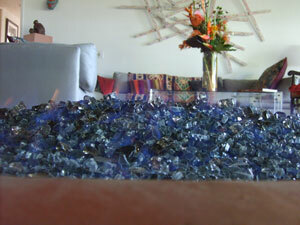 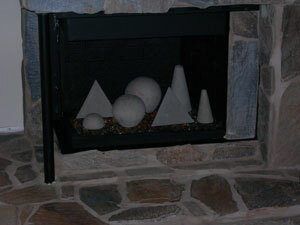 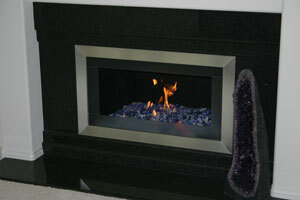 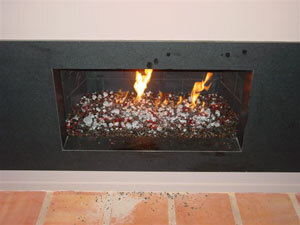 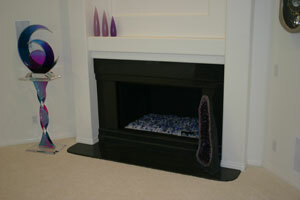 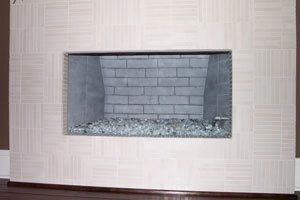 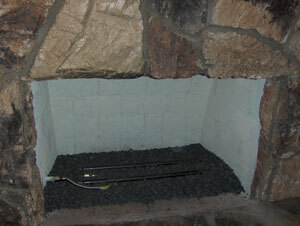 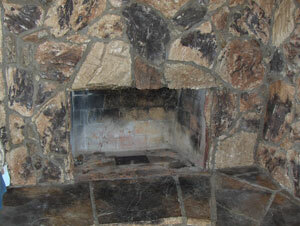 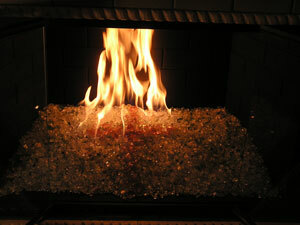 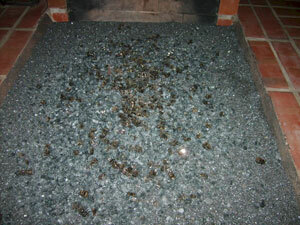 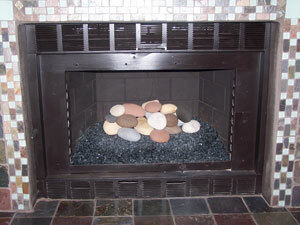 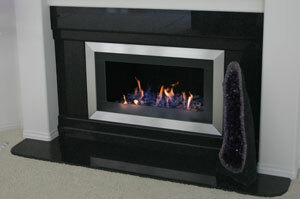 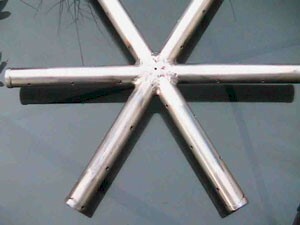 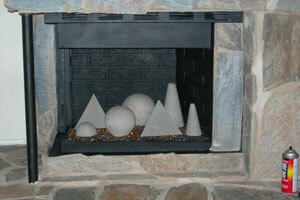 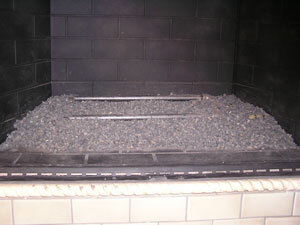 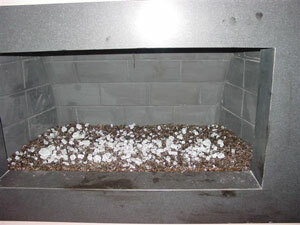 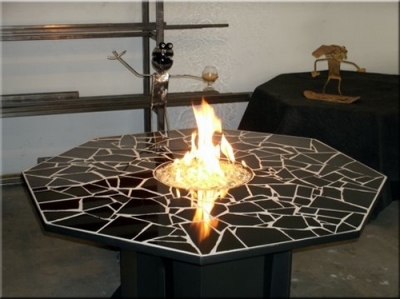 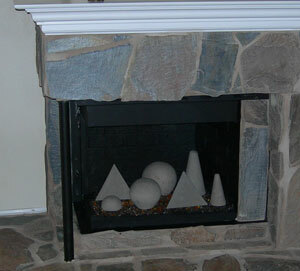 The fireplace below has Clear, Gray, Black, Clear Pyrite and Topped with Starfire. 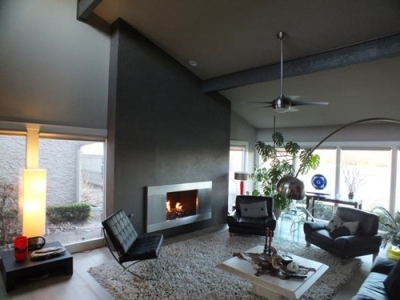 Very modern. 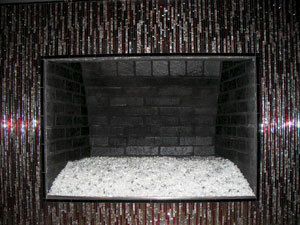 The fireplace above has Gray fireglass and Black fireglass. 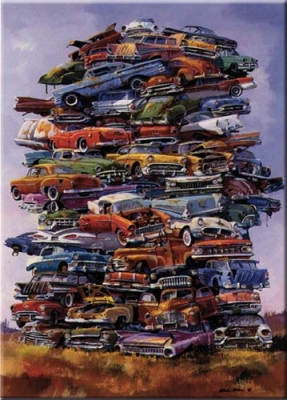 This one is sad, funny but true.